JasperReports is a powerful open source reporting package, but generating reports with data from multiple sources is hard and often impossible without the enterprise version. Subreports may work in some cases, but joins between tables in different sources is not easily handled with subreports. Although these issues may be tackled at the data layer using ETL, data warehousing, or data virtualization, that represents an additional cost in infrastructure and time for deployment and management. Download free trial. Feature list. 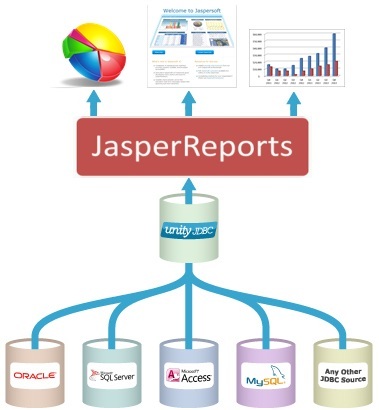 UnityJDBC provides real-time, multiple source reporting and data virtualization integrated into JasperReports. Cross-platform reports deployed in a few days. No data warehouse or new infrastructure, reducing costs and time by 80%. "Jasper is missing the ability to report across multiple data sources simultaneously. Without UnityJDBC we would be unable to make full use of JasperSoft BI and reposition our organization away from highly expensive tools such as SAP Business Objects." Install UnityJDBC by placing the UnityJDBC.jar file in the classpath for your installation. Register a UnityJDBC source in JasperReports. Build your SQL source query as usual but now with the power to join and translate data from all your sources. No subreports required or passing parameters or return values. To JasperReports, it looks like all your information is coming from one source. Finish your cross-database report that combines your valuable but distributed information in a few hours.